The Great West Saddlery Building is located in the old warehouse district of downtown Edmonton. The five-storey building dates back to 1911 when it was built to meet the growing needs of the Great West Saddlery Company. By 1918 this manufacturer of leather products held the claim to being the largest saddlery company in the world. The building had long since been vacated by this company when SNAP (Society of Northern Alberta Print-Artists) formed as an artist collective in 1982.They set up a printshop on the fifth floor. This building looks and acts its age. It is a heat trap in the summer and an icebox in the winter. The roof, because of its age and lack of upkeep, acts like a sieve. Yielding to the extreme climatic shifts between heat and cold - the repetition of thawing and freezing - the roof has become a producer of drips. If a leak goes unnoticed and is persistent enough, the liquid will filter through the whole building, accumulating particles of dust, wood, metal, paint and whatever else might be picked up as it passes through each floor. If the drip is the genesis, then gravity becomes the means of imprinting. 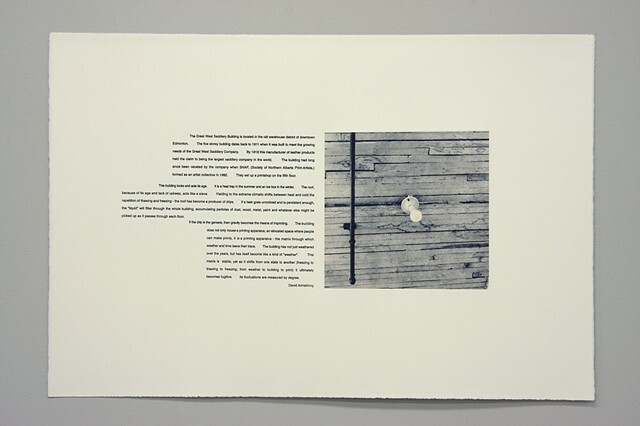 The building does not only house a printing apparatus; an allocated space where people can make prints, it is a printing apparatus - the matrix through which weather and time leave their trace. The building has not just weathered over the years, but has itself become like a kind of weather. This matrix is stable, yet in shifting from one state to another (freezing to thawing to freezing; from weather to building to print) it becomes ultimately fugitive. Its fluctuations are measured by degree.